World War I soldiers from Wheeling, West Virginia, Lester Scott and Charles "Dutch" Riggle were drafted in 1917 and trained at Camp Lee, Virginia. Lester Scott served as a Wagoner (mule team driver) in the 314th Field Artillery Supply Company, Battery “A,” 80th (Blue Ridge) Division in France. Dutch Riggle was a PFC with the same unit. These are their letters home. 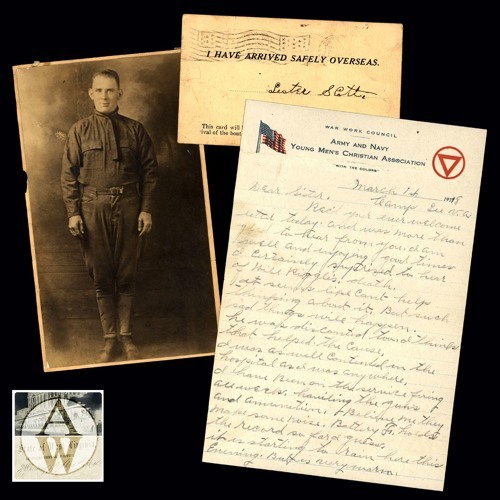 "From Camp Lee to the Great War: The letters of Lester Scott and Charles Riggle" is brought to you by http://archivingwheeling.org in partnership with the Ohio County Public Library (Wheeling, WV) and the Wheeling Academy of Law & Science (WALS) Foundation. Jeremy Richter is the voice of Lester Scott and Vince Marshall is the voice of Charles Riggle. The letters of Lester Scott and Charles Riggle were transcribed by Jon-Erik Gilot. This podcast was edited and written by Sean Duffy, audio edited by Erin Rothenbuehler with music courtesy the Library of Congress. Many thanks to Marjorie Richey for sharing family letters and the stories of her uncles, Lester Scott and Charles “Dutch” Riggle, WWI soldiers from West Virginia.